Many of the same people who rely on ImagePrint to produce the best possible output for their images also rely on Adobe’s Lightroom to process and organize those same images. But… getting them from one program to the other can sometimes be a bit of a chore, requiring you to export the image from Lightroom, find the exported file on your computer, then re-open it in ImagePrint. Wouldn’t it be nice to avoid those extra steps and just go straight from Lightroom right to ImagePrint? Well, it turns out there is a way to do just that. By setting up ImagePrint as an External Editor in Lightroom. We’ve talked in the past about one other alternative to having to save files before printing them–ImagePrint’s PTA (Print through Applications) option, which is an add-on to ImagePrint that allows you to send prints directly from any program on your Mac or PC to the ImagePrint spooler by just clicking Print. But, when it comes to Lightroom, there’s another way to get files into ImagePrint that also avoids the dreaded File Save and File Open dialog boxes–one that doesn’t require any optional components and can be set up in less than a minute. Lightroom’s External Editor feature is the key. By setting up ImagePrint as an external editor, you can simply choose to Edit in ImagePrint to have Lightroom place an image right in to ImagePrint’s layout window. Once there, you can utilize any of the normal ImagePrint workflow tools to position and size the image, then click Print to send it to the printer. Remember: the image that appears in ImagePrint will be a copy of the original Lightroom image–nothing you do in ImagePrint will affect that original. Setting up ImagePrint as an external editor is easy. The following guide is for Lightroom 4.0 on Macintosh, but the same general rules apply to the Windows version as well as previous versions of Lightroom. 1. In Lightroom, choose Preferences from the Lightroom menu at the top of the screen. Then, choose the External Editing tab at the top of the Preferences window. Look for the section of the window labeled: Additional External Editor. Now, click the Choose button. In the Choose file dialog that appears, locate the ImagePrint executable. 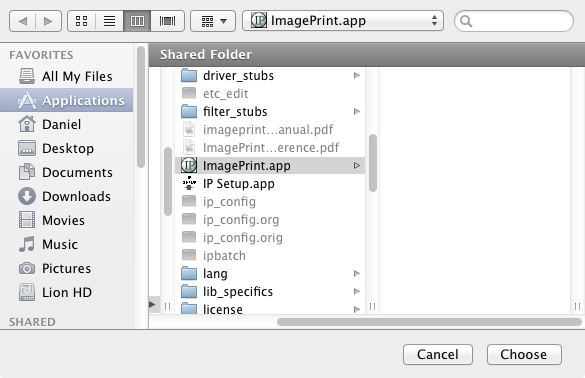 On Mac, the file you’re looking for is “ImagePrint.app” You’ll find it in the ImagePrint folder inside your Mac’s Application folder. On PC, look for the file “ImagePrint.exe”. You’ll find it in the ImagePrint folder which is located in your Program Files folder. Once you find the ImagePrint executable, click Choose to lock in your choice. 2. 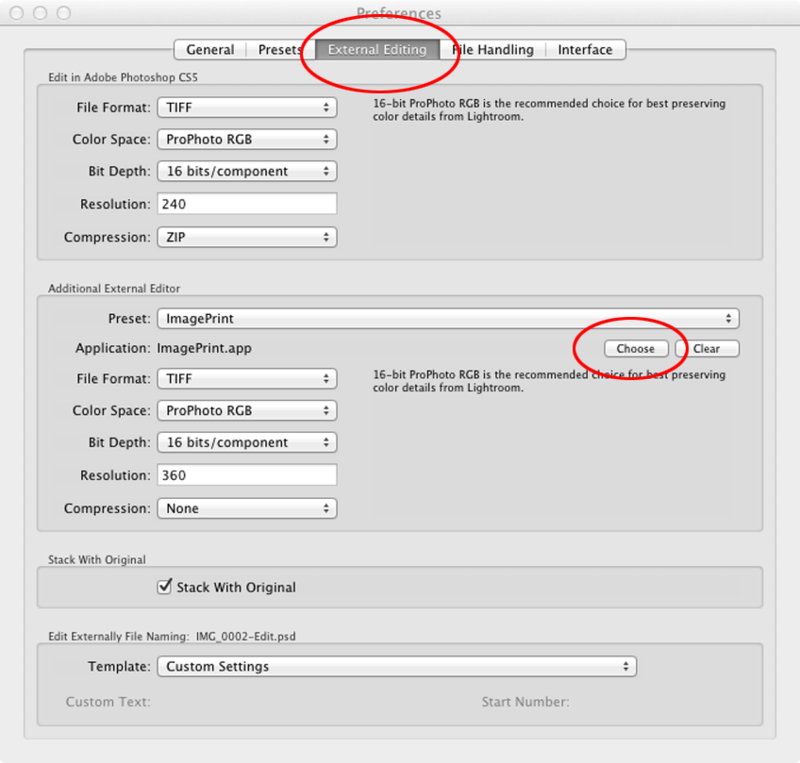 Now you can set some rules for Lightroom to follow when it sends images to ImagePrint. In the File Format drop-down, choose TIFF. In the Color Space drop-down, choose your preferred source space (usually Adobe 1998 or Pro Photo RGB). In the Bit-Depth drop-down, choose 16 bit. For Resolution, if you don’t plan to scale the image in ImagePrint, 240 or above is fine. If you plan to use ImagePrint’s scaling, you may want to go higher to avoid losing detail. Finally, for Compression, leave it at None. 3. Now that we’ve set up ImagePrint as our editor and set the rules that Lightroom will use, we need to save our settings as a Preset. top of the Additional External Editor area and choose Save Current Preset. Type in a name in the window that appears. (ImagePrint might be a good choice). Click Create, and you’ll have a new preset with the name you chose! Now, when in Lightroom, you can right-click (or control-click) the image and choose Edit in ImagePrint (or whatever preset name you used) to quickly open the image in ImagePrint. You can also find that option under the Photo menu at the top of the Develop screen. ImagePrint will launch (if it’s not already running), and the Lightroom image will appear in the layout window. That’s it. From Lightroom to ImagePrint, with one click. You may never have to use a File Dialog box again! 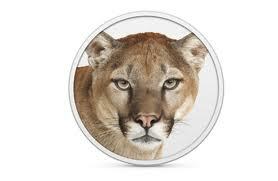 As you probably know, Apple recently released OSX 10.8 Mountain Lion. We’re happy to announce that ImagePrint 9.0 is fully compatible with the new release! However there are a few things you should do to ensure ImagePrint and the new OS play nicely together. Only ImagePrint 9 works with OSX 10.8. If you have a previous version, please contact our sales side for details on upgrading. After Updating your OS, update your ImagePrint 9.0 too! As with any operating system update, if you update the OS on a computer already running ImagePrint 9.0 you will need to download and run our Easy Updater to replace any system files the OS update overwrote. (Do this even if you are already on the most current ImagePrint 9 build.) You can get the ImagePrint 9.0 Easy Updater from ColorByte’s Technical Support page. Just download the Easy Updater for Macintosh, then double-click it to run it. No need to reinstall your printers or re-license the software. Important: Only run the 9.0 updater if you have a valid ImagePrint 9.0 license! For details on updating from a previous version of ImagePrint, contact our sales dept. Let ImagePrint through the Gate! If you find that ImagePrint (or any ImagePrint related application) is blocked from opening after installing Mountain Lion, it’s Apple’s new GateKeeper trying to keep you safe from unknown programs. Please read the below information to allow the software to run and not be blocked in the future. Mountain Lion has a new feature called GateKeeper that prevents unauthorized programs from launching. You may see a warning when launching ImagePrint for the first time after installing OS 10.8 telling you that the software is unauthorized to run. To allow software to launch in such a case, right click the application (or control click it) and choose Open in the menu that appears. You’ll then get a dialog with an Open button. Click the Open button and ImagePrint will launch. That’s it! ImagePrint will no longer be blocked from running in the future. The same procedure applies to any other program or utility you wish to run, such as our Easy Updater, our Installer or our Profile Manager. — Just Right click it when opening for the first time after installing Mountain Lion, choose Open, then click the Open button in the dialog that appears. If you find you can’t launch Spoolface by clicking the Spoolface icon at the top of the ImagePrint dashboard, you’ll need to manually open it once to tell GateKeeper to allow it. In the Macintosh Finder navigate to the Spool folder within the ImagePrint folder (in Applications) and right click the Spoolface application. Choose Open in the menu, then click Open in the dialog box that appears. Borders and Frames – What’s the difference? Frames are simple: A solid rectangle surrounding an image. Adding one is as simple as right-clicking an image, choosing “Add Background” and clicking FRAME in the window that appears. Next you specify the distance from the edge of the image, thickness and color, click OK and BAM: You have a nice frame around your image. If you want to get a bit more complex you can also specify a matte area between the image’s edge and the interior frame edge. This matte area can be filled with a solid color or left transparent, opening the door to lots of design options. (For instance, try placing a framed image with a transparent matte over another image–the underlying image will show through the matted area giving you a unique, personalized frame). Borders are a bit more complex. Instead of being limited to rectangular shapes generated by ImagePrint, borders are actually images themselves. You can create these border images yourself or purchase pre-made packages from companies that specialize in artistic borders. Just a couple of things to keep in mind about these border files: They need to be in PhotoShop PSD format, 8 bit. And…each border file needs to match the aspect ratio (in other words, the shape) of the images you plan to apply it to or some part of the image will be cropped to fit. Also, size matters–when you apply an border file to an image, the image will be resized to match the size of the border file. 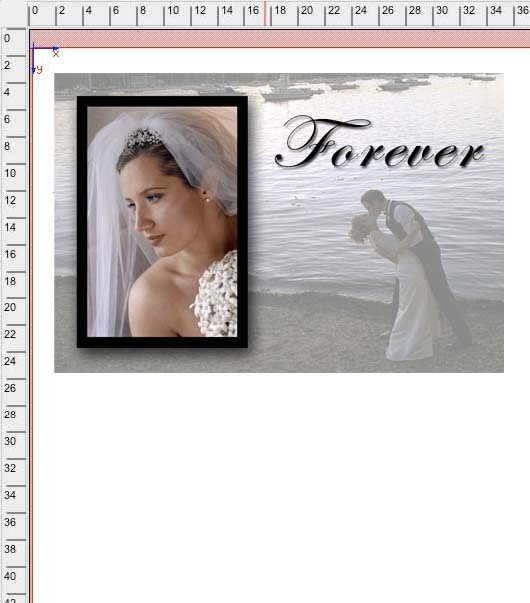 Choose to apply an 8×10 border to a 4×5 image and you’ll end up with an 8×10 bordered image (you can resize it afterward though using ImagePrint’s normal scaling tools). Once you have them, border files need to be placed in the Borders folder within your ImagePrint folder. 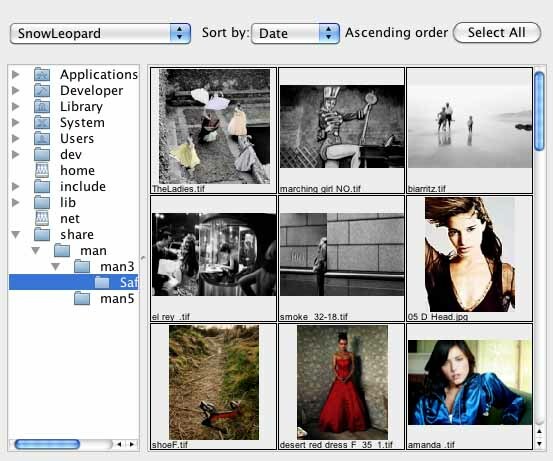 Then you can select them from the Border Browser (available under ImagePrint’s View menu). Double-click a border from the Border Browser to apply it to an image. The original image will show through the transparent areas of the border file while the non-transparent parts of the border will overlay it. This allows for effects such as sloppy or ragged borders (simply create a PSD file with the edge you want to achieve and all other areas transparent). Borders can also be used for effects that aren’t really “borders” at all–like placing your logo in the bottom corner of photographs or creating cards with transparent areas for people’s faces, or… well, the possibilities are almost endless. So… Frames or Borders–which to use? It depends on your needs. Want a simple, colored rectangle around your image, maybe with a matte interior? Frames are the way to go. Need an artistic, ragged edge or vignette effect, or an easy way to apply a static graphic effect or logo to images? You should be looking at Borders. Need more information? Frames are discussed in much more detail in the ImagePrint 9 User’s Guide (chapter 13). Borders are discussed in chapter 11. Boundaries – Layouts within layouts! ImagePrint makes it easy to add multiple images to a layout, but did you know there’s a way to create “sub-layouts” of images within a page? The feature is called Boundaries, one of the most versatile and unique (and probably unknown) of all ImagePrint’s layout features. You can use a boundary to quickly put a colored background behind a group of images or just use it as an easy method of placing and moving groups of images while maintaining their position relative to one another. Boundaries can be especially useful on larger printers as it allows you to easily create multiple album pages or greeting cards within a single page. You create a boundary by right clicking (or control clicking if you don’t have a right mouse button) in an empty spot within your ImagePrint layout area. In the menu that appears, choose “Add Boundary”, then in the “Add Boundary Area” window type in a width and height (choose a size smaller than your current page, but one that will accommodate the images you plan to add). By default the boundary will be transparent, but if you want it to be a colored background, choose Solid at the top of the window and pick your color via the color picker menu at the bottom. You should now see the boundary on your page. Now open some images and drag them into it. You can click and drag images to move them around within the boundary area just like normal–nothing too special there. But once you have some images within the boundary–try clicking an empty spot within the boundary and dragging. The boundary itself moves, along with all of the images within it. You now have a region of images you can move anywhere on the page! Once a boundary has been created, it’s size and color can’t be changed, so to make alterations you’ll need to delete it and recreate it with the new parameters. You delete a boundary just like an image–click the boundary, then choose the black scissors icon from the floating tool palette. There’s a lot more that can be said about boundaries (for instance, the way they handle crop marks and annotations of images dragged into them is, well, cool) but that’s all we have space for here. You’ll find more information within the user’s manual (chapter 13) but those are the basics of this powerful, unique tool. Most users know that ImagePrint always “soft proofs” its display, guaranteeing the preview you see on screen will match your printed output. However, while colors are accurate, you may find that the on screen image is too small or doesn’t show enough detail to accurately represent the final print. 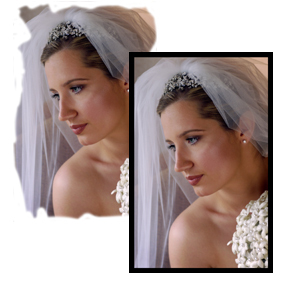 Did you know that ImagePrint offers two ways to increase the details of its displayed images? By setting a different preview resolution, or by using our “hi-resolution” view. To set a different preview size, choose Preferences from the ImagePrint menu (Mac) or View menu (Windows). In the General section, change the “Preview Size” to a higher value. The default is 512, but you can increase it all the way to 1536. The next time you open an image after changing the setting you should see a sharper preview. Even with a maxed out preview resolution, you may find that the on screen image still isn’t detailed enough. To see a “really” detailed view, you can view the soft proofed image in a high resolution window that shows all the detail of the final print. Just right click the image (or Control-Click if you’re a single button mouse user) and choose “High Resolution” from the menu that appears. The image will appear in its own window, complete with a toolbar that let’s you zoom in on any part of it, allowing you to soft proof the image in all of its high resolution glory.